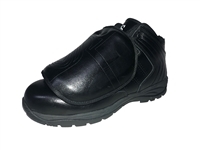 The Low-Cut version of the base shoe designed for and worn by Major League Umpires. Available in all Black or Black with White trim. This mid-cut base shoe is the official footwear of Major League Umpires. Available in Black or Black with white trim.